As today saw the temperature plummet from the heatwave of the last 4 days, I decided to duck up the hill to Mt Gawler – VK5/SE-013 and see what the bands were doing – well, that and go out and hope to get a VK5 to ZL1 S2S as there was some ZL1 activity going on. This was a bit of a different activation today as I went with a little bit of new kit for the first time. Can you guess? no ? Ok, the SideKar and keyboard for direct entry logging is not new, had it for a while now and am really starting to get used to it rather than the paper log. You might have noticed the external amplified JBL speaker, but no, that’s not it either! Ok, it is the QRO! (well not quite) but the HR-50 amplifier to give the KX3 a bit of a bump from 10w up to the 50+ watt mark (well, more like 60w on most bands). I have had the kit for a few month’s and managed to put it together about a week ago and today was the first time I have had a chance to give it a run in the field. By All reports – the bit of extra output helped – pretty good reports all day. Band conditions were very strange – very short hops on bands where it was not really expected! I started out on 15m and worked VK3, VK1 and VK7 stations. On the suggestion of Tony, VK3CAT, I then gave 10m a try and was rewarded with VK3 and VK1 contacts for my log. As I was using the 30m dipole for 10m, I then gave a call out on 30m and worked VK2, VK3 and VK5. 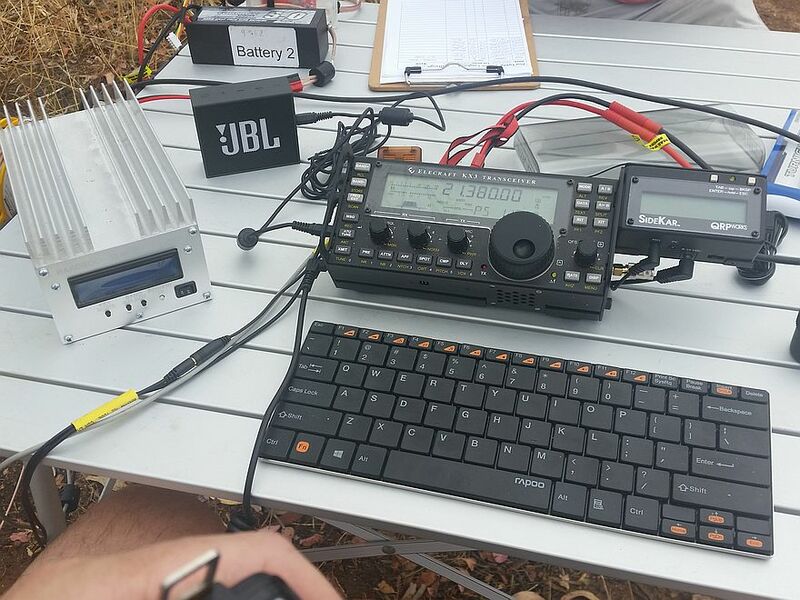 20m was the best band of the day and I worked VK2,3,4,5’s and ZL3CC for my only DX of the day. I always end up on 40m for at least a bit of every activation and I worked into VK2, VK3 and VK5 before I packed up for the day. I was able to round out the day with the final station logged of VI3ANZAC on the last day that this call will be activated. I did see the spots for ZL1 activation on 20m and could hear a few of the chasers, but alas, no VK5 to ZL1 S2S today, but hope it won’t take too long to get one! As always, thanks to all the chasers as you make it all worthwhile.